ii. Set MAP values on a group of electrodes rather than on individual electrodes. For (i), measurements of the electrically evoked compound action potential (eCAP) using back-telemetry (Abbas e.a. 1999), electrically-evoked brainstem recordings (Brown e.a. 1994) and electrically-evoked stapedius reflex thresholds (Hodges e.a. 1997) are often performed during surgery. The results of these objective measures are mainly used as a starting point for user MAPs, but show considerable variability in the identification of stimulation levels within the behavioral dynamic range, and lack accuracy in indicating the limits (thresholds and Most Comfortable Level). With respect to (ii), changes in MAP values for a group of electrodes may be effectuated through the fitting software of the different devices, by selecting and modifying electrodes group-wise. As such, the profile of the lower or upper stimulation levels of the entire electrode-array is adjusted. The main shortcomings of these processor-fitting procedures lie in the fact that they are dependent on comfort indications from the patient on the one hand, and on the expertise of the audiologist or other personnel performing the measurements and adjustments, on the other hand. Although it seems reasonable to rely on feedback provided by the patient, comfort indications, especially when obtained from patients with little or no auditory experience may vary according to the methodology employed, instructions to the patient, etc. The expertise of the fitting personnel generally builds on training provided primarily by the cochlear implant manufacturers, but there exists no standardized methodology making it very difficult to verify the quality of the fitting process. Anecdotal reports from clinical specialists working with CI manufacturers suggest that patients with grossly inappropriate MAPs are occasionally encountered. In sum, it has been argued that after 20 years of cochlear implantation, fitting the implant processor still builds on setting a limited number of electrical parameters based on behavioral responses related to the level of detection and some level of comfort, a time-consuming operation of which the reliability can be questioned (Govaerts e.a. 2009). 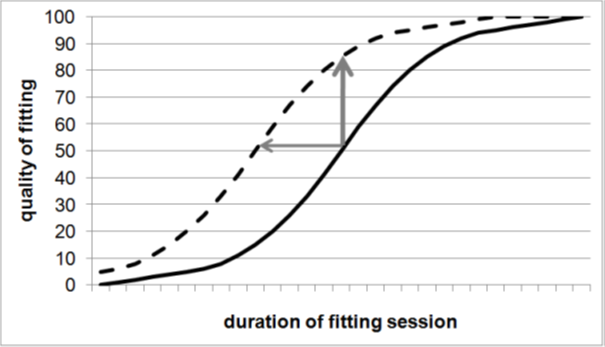 The innovational aspect of the automated fitting procedure (FOX®, Fitting to Outcomes Expert) consists in the reduction of the amount of fitting time and in the achievement of better outcomes by introducing deterministic bottom-up artificial intelligence. This new artificial intelligence component will involve the optimization of the input (the number of adjustable parameters needed) on the one hand, and the development of a model by which output can be predicted on the basis of particular parameters. The use of such a new type of artificial intelligence is a high-risk high-gain operation: it requires instantaneous feedback of large amounts of outcome data and, as it generally takes a substantial amount of time to obtain outcome measures from humans, whether this new technique is feasible must be investigated. Yet, if the development of such a predictive model is successful, it will be possible to equip the intelligent agent with learning skills, allowing an almost continuous improvement based on permanently monitored effects. Once the model has proven to have sufficient predictive value, the next and final step in the automation process is to turn it into a clinical application. Such an application should ideally be capable of autonomously (i) analyzing input data; (ii) identifying those implant parameters that are not yet optimally set; and semi-automatically (iii) adjusting these parameters to obtain an improved hearing performance.